I had a bit of fun with this card and made it into a Pop-Out and not a Pop-Up card. The image is Reindeer Pull by Sassy Cheryl the embossed background is a Cuttlebug Enbossing folder lots of Crushed Glass Glitter and a Stampin Up wheel stamp for the swirls. 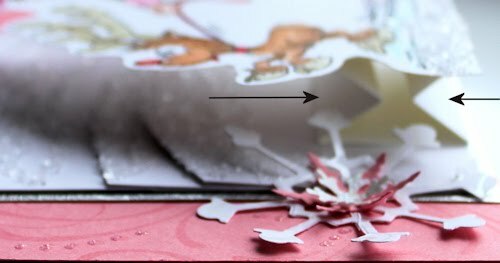 I wanted to show you the mechanism to the pop out, it is a box but with and extra scored fold at two of the sides so it will work as a concertina, this means that it will still go into an envelope but it will pop out again when removed. Pink and Green are my two fav colours to put together. I just love this card. Thanks for info on how to do the pop out, simple when you know how! Oh this is fantastic Jak....just a wonderful card and love the pop-out mechanism too. Great idea Jak and lovely card. wow love the design, look amazing and the colours combo is so joyful. Gorgeous card, love the pink and green. So very clever Jak....Beautiful card and so love how you have used that embossing folder. Jak, what an awesome challenge card you have created. Love the colors, embossing and the pop-out element is perfect for dimension...you are so clever as always :) Thanks for playing along with the Sassy Cheryl's Challenge this week. Yet another AMAZING card. You are so talented Jak! Absolutely love it! This is AWESOME!!! That embossing folder is the PERFECT background! Jak, this card is beautiful. Love the pop-out dimension! Double WOW! what an amazing card! I love the use of the embossed village in the background.. lovely frame for this fantastic image.. great colors too! Thanks for joining us in the Sassy Cheryl Challenge this week! Lovely card Jak. I have recently bought some Flippin Men and Flippin Women stamps, is there a background CD or background sheets that can be bought seperately? This card is just beautiful. Love the pink and the white color combos with the snow. Love the embossing. Pop-out box idea is the cleverest and the coloring is superb. Oh and did I mention that I LOVE IT! What an awesome card. LOVE IT! Can't quite see how far under the folds go....I can see the two folds but how much more is attached to the card? The length of the rest of the image??? I work as a freelance Designer in the craft industry I am also a Certified Powertex Tutor and run weekly workshops. I live in the North East of England and I'm married to a wonderful Husband, Chris, together we have two beautiful Daughters and a cheeky faced Grandson who make us so very proud in so many ways. All of the contents on this blog are © Jak Heath and under no circumstances should they be used or copied for submission to competitions or publications.